A property billed as being ‘Bermuda style’ is for sale in Palm Beach, Florida, with the 4,130 square foot luxury home priced at $5,395,000, while another property in the area also described as ‘Bermuda style’ is selling for $4.3 million. The real estate listing on Luxury Portfolio for the property above said, “Ready for your immediate enjoyment! 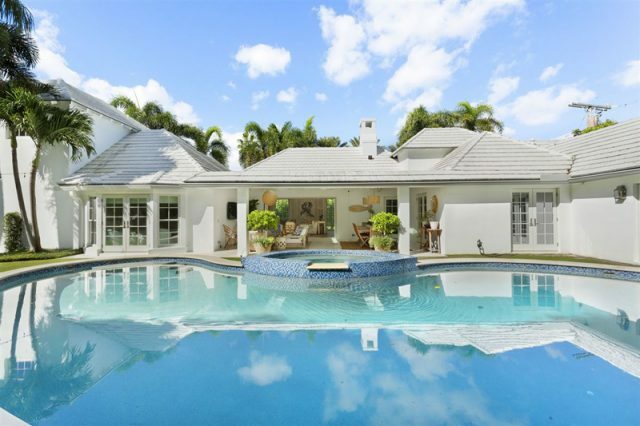 Modern five bedroom Bermuda recently renovated with impact windows and doors, new kitchen, new lighting, new Carrier air conditioner, new master bath and closets has a wonderful layout on a 15,269+/- square foot parcel. Main rooms open with French doors to spacious covered loggia with built-in barbecue, seating and dining area each brightened by new skylights. “High ceilings, French doors, tall windows and living room pocket sliders light up the home with an abundance of natural light. Dual-sided gas fireplace in the living room and eat-in kitchen adds to the casually elegant feeling throughout the home. Lovely, large east-facing outdoor space with heated pool, privacy hedges and garage complete this Mid-Town offering. The property above is described as a “sensational Bermuda style home,” and the real estate listing said, “This stunning house was completely renovated and redesigned by renowned architects Richard Sammons and Anne Fairfax in 2018. “There are 3 bedrooms, 3 baths and 2 half baths. Interior elements include natural coquina stone floors throughout, pecky cypress beams in the dining loggia, soaring tray ceiling in the living room and multiple sets of French doors leading to the surrounding gardens and terraces.